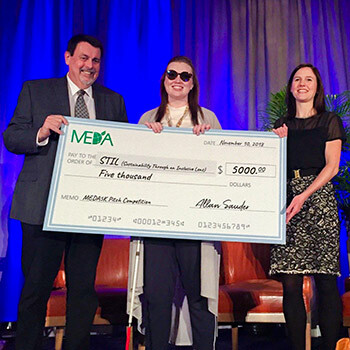 Waterloo – Wilfrid Laurier University student Hillary Scanlon, who is legally blind, won first place at the MEDAx conference pitch competition in Indianapolis, Indiana Nov. 10 for her floor-tile product that helps make recycling accessible to those with vision loss. The competition awards $5,000 to an early-stage social entrepreneur or community innovator whose business aligns with MEDA’s values of sustainability, scalability, innovation and empowerment. When Scanlon found she could not differentiate between garbage and recycling receptacles on Laurier’s Waterloo campus, she took steps to make sustainability inclusive for all students by developing thin, rubber floor tiles that lay in front of garbage, recycling and compost receptacles. The surface of the signs, different from the rest of the flooring in the area, makes them detectable by cane, foot or sight, alerting passersby that they are near a disposal unit. Scanlon created the tiles and her business, Sustainability Through an Inclusive Lens (STIL), through the Faculty of Arts’ Social Entrepreneurship Option. Scanlon’s success at MEDAx, which draws an international audience and multiple competitors, illustrates Laurier’s leadership in social entrepreneurial programming. Laurier social entrepreneurship students Perri Termine and Kamil Ahmed also attended the pitch competition with Scanlon and Pries. To date, Scanlon has secured more than $40,000 to fund her venture. She is also Laurier’s first-ever Student Social Entrepreneur-in-Residence. Wilfrid Laurier University is the first Canadian university to offer undergraduate social entrepreneurship programming grounded in the liberal arts. The Social Entrepreneurship Option builds on arts-related strengths while incorporating the element of entrepreneurship to create innovative, self-sustaining solutions to the world’s most intractable problems. Learn more about Laurier’s Social Entrepreneurship option and C3 Innovation Labs. Read the feature story about Hillary’s accessible recycling solution.